First things first…we hope everyone had a great Thanksgiving! Hopefully those who travelled had uneventful trips with nothing approaching Planes, Trains and Automobiles. But now it is time to return to the business of this blog, TEETH! We are going to answer 2 questions today. Do you know if you have fluoridated water? And what does fluoride have to do with teeth? The first question is easily answered. If you have well water, there is a very strong chance that you do NOT have fluoridated water. If you have community water (Canton City, Massillon, etc.) then chances are you DO. Our second question will take a tad longer and requires some history and science. Stay with me, it isn’t that boring. Fluoride was first added to select water supplies in 1945, with The US Public Health Service recommending that water fluoridation be instituted nationwide in 1962 (more on that later). Alright, hopefully you are still with me because now I can explain why we decided to talk about this in the first place. Remember that the US Public Health Service recommended the nationwide implementation of fluoridated water (I only mentioned it 2 paragraphs ago)? Well without going too deep into our Constitution and the concept of Federalism, local communities have the authority to determine whether their water gets fluoridated, not the Federal Government. And every November (i.e., election time) the American Dental Association (ADA) sends a newsletter stating that some communities have decided to stop fluoridating their water supply. It just so happens that this year multiple communities voted to stop! Why? It turns out there are two common reasons. The most common one is the existence of ‘studies’ attempting to connect the presence of fluoridated water with autism and various types of cancer. These studies are poor at best. The other often cited reason is a fear of a government putting things into the water supply. I really don’t feel I need to rationalize that statement…just throw away the tin-foil hats. In reality, the effects of fluoridated water have been vigorously studied by both the government and private researchers. And the results are quite clear. With over 50 comprehensive studies and 25 systematic reviews (think studies of the studies), there is no strong link to cancer or autism. Water fluoridation has been a resounding success because dental cavity rates have significantly declined since 1962. The CDC even cited water fluoridation as one of the top 10 most significant public health programs of the 20th century! Ok, lets wrap this up. Obviously we feel that fluoridated water is a tremendous benefit to a growing child’s teeth. Teeth are going to be stronger and more resistant to cavities. Adults also see the same benefits but at a more superficial level. So here is some homework. You can find out about your water supply by contacting your water company. Ask them if the water is fluoridated, and what is the concentration. The current recommendation is 0.7mg/L (that’s milligrams per Liter). If you have well water, you should ask your Dentist (or Orthodontist) if supplemental vitamins would be beneficial for your kids. If you have any questions about this, please don’t hesitate to contact us. Welcome back everyone. While there are still so many topics to discuss, I wanted to briefly touch on one of the newest, and worrisome, fads today in Orthodontics. Most likely you have read/heard about Direct-to-Consumer (D2C) companies. To make sure everyone is on the same page, I will briefly explain. D2C companies are those that market their goods and services directly to the public. There are no middlemen (think stores), and as such they are able to reduce their costs AND therefore sell their products more cheaply. Dentistry and orthodontics are not immune from the D2C trend. These companies specifically market do-it-yourself (DIY) treatments. There are dental labs that will produce snoring appliances, removable dentures, and different versions of veneers to make someone’s smile appear whiter and brighter. Those are all treatments that have the potential to permanently change teeth, bone and gum tissue! Even in orthodontics there are now a few companies advertising to produce clear aligners (trays) to straighten teeth! The American Dental Association (ADA) and American Association of Orthodontics (AAO) have both released statements regarding these D2C companies. Obviously consumers, when using D2Cs, are bypassing the doctor’s essential role in diagnosing and treatment planning. What could possibly go wrong with this scenario? Well, apparently many things have gone wrong and now the American Dental Association (ADA) is working with the FDA on helping consumers report their problems. Check out the article here. In our own practice we have re-treated 5 people in the past year who have tried their luck with DIY orthodontics. Also, one of our colleagues recently posted a video of a patient who was seeking his orthodontic expertise to correct a DIY treatment gone bad. I was going to include it but it was recently taken down because the D2C company is suing him! Go figure. Obviously we discourage anyone from pursuing DIY dental or orthodontic treatments. Without proper oversight, these seemingly “simple” and “easy” treatments can lead to irreversible harm at worst, or simply a very expensive re-treatment at best. Unfortunately I don’t believe we can now close Pandora’s box. DIY treatments will remain, especially as their marketing budgets swell and consumers remain largely uneducated on the necessity of doctor-based care. So, why write something like this? Well maybe you will share it with someone who is thinking about DIY orthodontics. If nothing else perhaps it will persuade them to dig a little deeper with their research. Consumer education is everything, and hopefully this helps. Dr. Nate here today. So, here we are in the middle of Summer...We sincerely hope everyone has had a great start to their Summer activities! Our whole family just got back from our yearly beach vacation, and while we were there I was finally able to catch up on the latest Orthodontic news. There is an Orthodontist in England named Kevin O’Brien who writes a very good blog about Orthodontics. He is a professor of Orthodontics and a talented writer who has made quite the name for himself, even in the US. In his most recent post (which is here) he mentioned that the British government, namely the Advertising Standards Authority (ASA), forced the company promoting their Orthodontic vibrating device to remove their ads for a very serious reason. Instead of summarizing, I will pull the important quote. When I finished Dr. O’Brien’s post, and then read the full ASA document, I could hardly believe it! And then I became frustrated for two reasons. First, the same standards haven’t been applied here in the US. Treatments without excellent research results should not be presented to the public through advertisements! Secondly, as a supposed learned specialty within Dentistry, Orthodontists should be able to discern good quality research from poor research. That is our responsibility to the public...don’t treat patients with something that doesn’t work! If you have made it this far, you should know that I fully understand that this rant has been more cathartic for me than entertaining for you. Selfish? Of course. But my (and Dr. Theresa’s and Dr. Nick’s) standards are very high when it comes to treatment decisions. Ask us why we do this treatment, and not that one. We will be glad to tell you, and show you the research backing it up. New technology is great, but not always effective. That is an important distinction. Dr. Nate here today and I wanted to discuss a new trend in Orthodontics. Every profession chases their own ‘Holy Grail.’ It is the target at which progress attempts to hit. Orthodontics is no different…but what IS our target? Speed. And more speed. In fact, this is the most common question we hear…”How long do I have to be in braces?” It is an appropriate question too. Families want to get the maximum benefit with the minimum treatment time. That not only helps the patient in terms of the final smile, but also minimizes the biggest risk of Orthodontics (think oral hygiene here). The quest for faster treatments has had many targets. For example, bracket designs have been changed umpteen times and wires have been modified in both materials and sizes. The result after roughly 75 years of tinkering…a slow, but definite decrease in treatment time. Recently, however, speed has plateaued with traditional appliances. More novel concepts are being developed and brought to market. One popular product is focused on making teeth move faster with vibration. They make a powerful assertion…use their device for 20 minutes a day and teeth will move up to 50% faster! Amazing, right? But, as with anything else in the medical and dental worlds, research results are the ultimate proof of success. As of me typing this on a very early Saturday morning there are 4 published articles on this topic. Any guesses as to the consensus??? So, what is the point of all of this? If you made it this far, here you go. If you picture Orthodontics as a biological process (which it is), bone and bone cells are the arbiter of treatment time. Logically, do bone cells “care” that they are being vibrated? And is their response going to be to make the teeth move faster? The research clearly states that the answer to both of those questions is a resounding NO. We obsess over the best research to determine whether new treatments are going to make a difference to our patients. If we use it, then we can easily back up WHY. If we don’t, well make your own conclusions. Speed is undoubtedly important, but we NEVER compromise the quality of our treatments. And the smiles are all the better for it. In the hope that Dr. Nick soon would be there. Tore open the door, and threw on the light. I knew in a moment it must be Dr. Nick! When they meet the doctors with eyes to the sky. With his white doctor's coat down to his toes. They twinkled when he smiled, like he'd won a prize. He was skinny and fit, a right jolly old elf. And I laugh’d when I saw him in spite of myself. Soon gave to know I had nothing to dread. And fix’d all our smiles; then turn’d with a jerk. Happy Christmas to all, and to all smile bright! Dr. Nate here again today on the blog. Last week I left everyone in suspense regarding Part Deux of Netflix’s hit show Stranger Things and their connections to the dental world. If you didn’t read last week’s post, head back to our blog to catch up! Now, in full disclosure I didn’t notice this other dental connection myself. It came across my email from a friend/colleague in Missouri. What’s cool about this connection is it’s much more specific to Orthodontics than General Dentistry. Recall last week I wrote about Dustin’s (real-life Gaten Matarazzo) genetic condition called Cleidocranial Dysplasia. It requires significant dental work, which Dustin frequently referenced in this second season by calling his new teeth ‘pearls.’ The second connection to Orthodontics is actually a t-shirt! 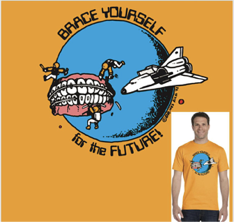 In one of the episodes, Dustin is wearing a t-shirt that reads “Brace Yourself for the Future!” It is from an Orthodontist in Springfield, MO named Dr. Wes Allai. When he first opened his practice in 1982, he made these shirts to hand out to his community. They are cool in the way the rest of Stranger Things is cool…very 1980’s. The graphics and the wording all point to something very familiar to those of us who did grow up in the 80s. I found a recent interview with Dr. Allai and he said he doesn’t know how one of his shirts made its way onto the set of Stranger Things. He stopped making them over 30 years ago! But, being a true business man he is now offering the same shirts through Etsy. Dr. Nate back at the blog. For those keeping tabs, it has been a while since we last posted an entry. And, to get comfortable with writing again I am going to start off with a topic that has gained considerable attention recently through the pop media. One of the main characters is a young boy named Dustin, played by Gaten Matarazzo. He is quite an actor, and his character is very funny and sweet. Gaten has a genetic condition called Cleidocranial Dysplasia, and the show has incorporated his real-life condition to Dustin. In fact, now that the show has made its way through 2 seasons (roughly 20 episodes), the writers have referenced Gaten’s condition multiple times. So, what exactly is Cleidocranial Dysplasia? It is a genetic condition that affects mostly the development of bones and teeth. As we are Orthodontists, I am going to focus on the teeth. The condition most often leads to an absence of permanent teeth, as well as slow eruption of the permanent teeth that are present. It is definitely a condition that requires meticulous planning and collaboration between the General Dentist and Orthodontist to ensure the patient has both an amazing smile but also a functional bite that will last a lifetime. Now the great thing about Stranger Things is that they have discussed Gaten/Dustin’s condition in a way that has empowered other kids with Cleidocranial Dysplasia. To check for yourself, Google Dustin’s name with Stranger Things. You will find many articles that talk about how Gaten has helped other kids be more open about their condition! In our practice we have been honored to take care of kids with Cleidocranial Dysplasia, as well as other Craniofacial conditions. Being able to help these kids to smile confidently is a tremendous privilege! Dr. Theresa here today to write about an intriguing subject: impacted teeth. For the sake of simplicity, I will only focus on one of the most commonly impacted teeth, Maxillary (upper) canines. Canines are commonly referred to as the “i-teeth.” An impacted tooth means it has finished developing, but is unable to erupt. What makes the upper canines become impacted? There are multiple theories, and none of them have been officially proven. So we will discuss the most realistic ones. First, the size of the teeth could be larger than the space available in the jaw (simply called ‘crowding.’) When this happens, there is not enough space for the canine to erupt into the mouth which inevitably traps the canine in the bone. Second, the baby canine tooth does not fall out at the appropriate time. If the baby canine remains in the mouth too long then the permanent canine does not have a chance to erupt into the mouth. Remember, there is a ‘normal’ permanent tooth eruption sequence (more on that below). Third, the canine can develop sideways (horizontal), but no one has a reasonable explanation as to why. Lastly, the development of one of the adjacent teeth can affect the upper canine eruption path. Usually this would be the Lateral Incisor (one of your front teeth), and in the cases with impacted canines the incisor would be peg shaped and smaller than ideal. I put this theory in because we have seen a recent string of patients with extremely small upper incisors whose canines are impacted. Is there a way to avoid canine impaction? In most cases yes there is, but it does require an orthodontic visit around age 7. For those avid readers of our blog (all 6 of you—thank you by the way! ), we had a post about the ideal time to visit the orthodontist. Here is the link. So what are we, as orthodontists, looking for? We begin by making sure there is progress with losing baby teeth and gaining permanent teeth. We also take a special X-ray to determine the canine location. The X-ray also assesses the development of all teeth, and whether the baby teeth are inhibiting normal permanent tooth eruption. In regards to the upper canines, they normally erupt into the mouth around age 11. If the baby canines are not loose by age 10 AND you haven’t seen an orthodontist, it is our recommendation that you discuss the situation with your dentist. We are also happy to take a look at any time. As previously mentioned, early intervention can prevent or decrease the severity of an impacted canine. The goal of early intervention is to guide the proper tooth eruption, and to ultimately make any treatment as comfortable as possible. We hope that everyone has a great start to their Summer! Let's first start with physiology. Teeth are surrounded by bone, but that bone is subject to the forces of biting (occlusion). So while teeth feel firmly attached to your head, they are part of a mini-earthquake every time you bite down. This constant change can cause teeth to shift with time. As for the second reason, I have to start with some orthodontic research. Adults who had braces back in the early 80's will tell us that they were told long ago that retainers didn't need to be worn forever. And they are correct. But, just as anything else in medicine and dentistry, our treatments are based in the best AVAILABLE research. And up until 1985 orthodontists were recommending retainers be worn for "a few years." In 1985, an orthodontist named Rolph Behrents published a paper called "Growth in the Aging Craniofacial Skeleton" that definitively showed that faces continue to grow throughout a lifetime. Now understand that this growth is minimal, say 1mm over a 10 year period. But believe me when I say this paper was revolutionary in terms of dictating future orthodontic treatments, especially in the area of retainers. Why would a small amount facial growth affect tooth position? Dr. Behrents showed that facial growth isn't symmetrical between the upper and lower jaws. Instead the lower jaw grows more than the upper jaw. This tends to put stress on the lower front teeth, and causes them to crowd. This is why adults most often notice that their lower teeth have moved more than the upper jaw counterparts. Again, this is an insidiously slow process. But it is one that over 10 years will cause you to notice that your teeth have moved. So, how do we combat this? At the end of orthodontic treatment, we give our patients retainers. In a future blog post, we will discuss the different retainer types. These retainers do exactly what they say. They retain position. Our instructions are clear-wear your retainers as long as you want your teeth to stay straight. If you've had orthodontic treatment in the past, and have lost or stopped wearing your retainers, we would recommend that you find a way to get new ones. It is a simple solution that could help you avoid more complicated problems later. Adults have Something to Smile About! Dr. Nate at the computer today. It is a common misconception that, as Orthodontists, we only see kids for braces. 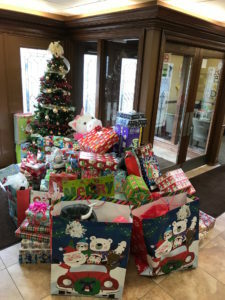 The majority of our patients are under the age of 19, but a rapidly growing number of adults are now either adding their smile to their bucket list or correcting treatment they had as a child. The increasing adult orthodontics trend is being seen nationwide. Different surveys put the number between 20-25%, and those numbers are at least a few years old. So, why do an increasing number of adults care about their smiles? The cynical person would answer that it is a symptom of our superficial society. Our experience treating hundreds of adults has shown that nothing could be further from reality. Besides… who wants to be around that person anyways? They probably never smile! Adults often renew their smiles through orthodontic treatment because of a relapse from previous treatment when they were teenagers. In fact, if you are an adult who has had orthodontic treatment when you were a child, ask yourself this question… Do you know where your retainer is right now? That’s what I thought (wink-wink). We’ll cover the importance of retainers in a future blog post, but teeth WILL shift with time (regardless if you have had previous orthodontics). But the largest percentage of our adult patients are completely new to orthodontics. They never had braces as a child so…. What brings them in? “I want a fantastic smile” …and that is great! Perhaps you picture your actual smile, but I would venture to guess you think of a memory that makes you smile. We call this the Smile-Emotion-Connection. There is a true emotional attachment with your smile and as a result, your happiness. That is partly why adults want their kids to have orthodontics, a 'beautiful smile' lasts forever in those memories. Adults are never too old to pursue a fantastic smile… A smile that can turn back the clock further than daylight savings time and give you one more reason to like what you see in every mirror you pass. Biologically, the teeth will still move the same (albeit slightly slower...there is always a catch). There are even cutting-edge treatments beyond standard braces that adults can choose from with the help of an Orthodontist who has dedicated his or her life to the art and science of tooth movement. When it comes to your smile a fraction of a millimeter in any direction can make the difference between a brilliant smile and just unremarkable straight teeth. So whenever you or someone you love is ready to take the next step, either myself, or one of the many world class Orthodontists around the county, will be patiently waiting with your new smile. Dr. Theresa here this week. Frequently our teenage patients, and their parents, will ask us, “Do I need to have my wisdom teeth taken out?” If these ‘wisdom teeth’ are so wise, why do they occasionally need to be removed? Well, lets start with a little background lesson on teeth. 32 teeth make a full set. On average, the first permanent molars erupt at age six, and by the early teens 28 teeth are present (including the 12-year molars). Then, there is a six year hiatus in tooth eruption while the third molars (wisdom teeth) continue to form. On average, third molars begin to erupt into the mouth at 18 years of age. Why then do most people NOT have their wisdom teeth? The problem is the amount of room, or lack thereof, for the wisdom teeth to erupt. The Maxilla (upper jaw) sometimes has enough room to allow for wisdom tooth eruption, but the Mandible (lower jaw) often does not. It gets pretty cramped back there! So, are we as a species shrinking? In the jaw, yes. Why? There are a multitude of theories on this one, but they are beyond the scope of this post. And none of these theories have been proven correct, so right now everything is speculative. Does everyone need their wisdom teeth removed? No. Our patients are monitored in conjunction with their general dentist to assess the likelihood their wisdom teeth will erupt. If it looks like their position will inhibit full eruption, or there won’t be enough room for COMPLETE eruption, then we recommend they are removed. It is as simple as that. Dr. Nate here this week. Welcome to Spring Break (at least for those not having theirs over Easter...)! And what is the one thing I know you were eagerly anticipating? This blog. You're welcome. If you have read our blog over its short history, most of the posts deal with answers to commonly asked questions in our practice. And today's is no different. What exactly do the brackets do, and is the design important? As discussed last week, teeth move because of a force applying pressure over time. The brackets transfer that force from the wire to the teeth. Without getting stuck in the weeds, that is essentially the answer. Brackets are a way to help move teeth by holding the wire in place. So the next logical question then is, does bracket design matter? If you ask the manufacturers, the answer is yes. About 15 years ago bracket design was at the forefront of 'new' orthodontic technology (never mind that the designs have largely remained the same since the mid 20th century, even the 'new' ones). What's that old adage about not know your history...? Certain companies came out with these new brackets they termed self-ligating. To not infringe on copyrights, I will not post pictures. Google self-ligating brackets if you want, but the simplest explanation is a traditional bracket with a garage door that would close around the wire. What made them so special? They would move teeth faster, cause less pain, and make treatment times go down. Basically they would do everything except end world hunger. Name something you don't like about orthodontics, and self-ligating brackets would do it. It got kind of nutty, actually. But did the bracket design matter? No. It took about a decade of research, but the conclusion was that all brackets work the same. And why wouldn't they? If you think logically orthodontics is a biological/physiological process involving cells, bone, and teeth. How does a cell in your body know if the bracket is a specific design? It doesn't. Orthodontics still comes down to the skill set of the Orthodontist, not the brackets they use. Dr. Nate here today, and I wanted to try and explain what exactly makes orthodontics possible. It can be summed up in three words, pressure and time (I suppose that is only 2 words if you don’t count ‘and’). Conceptually it seems impossible, because your teeth are very firmly attached to your head! They withstand the rigors of chewing, and can even absorb a fair amount of trauma (although mouthguards definitely help!). 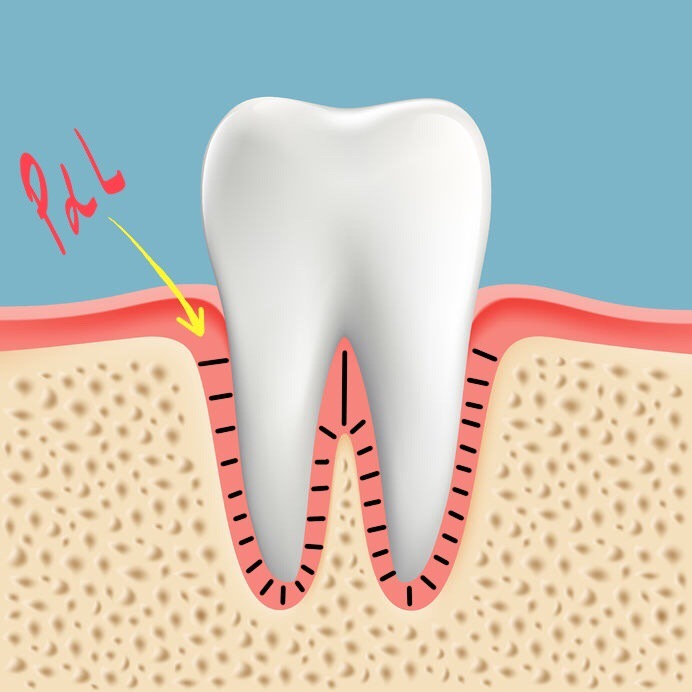 Biologically, teeth move because of a Periodontal Ligament (PDL) that surrounds the tooth. I have included a diagram below for those interested. It acts as a cushion, but the PDL is also what keeps your jawbone and tooth root from fusing together. That fusion is what can happen after a tooth gets knocked out of your mouth. But that will be a topic for later. The PDL responds to the braces, and the pressure they apply, by dissolving the bone adjacent to the tooth and giving a clear path of movement. 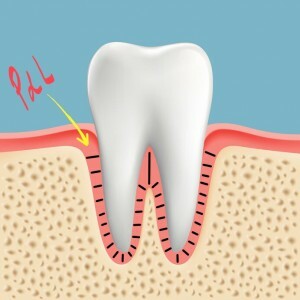 Once the tooth is done moving, the PDL regenerates the jawbone in that new position. Now, the time aspect of orthodontics. And for this blog post, the idea of time is not based on how long treatment lasts. Instead, the context of time here is based on how long it takes for a tooth to even think about starting to move. The pressure applied through braces or Invisalign needs to be CONSTANT for 8 hours before any movement starts! So, for those of you in treatment, do you now understand why we stress wearing those rubber bands full-time? Tooth movement is actually pretty amazing! This is the only area of your body where you can move something through bone WITHOUT surgery. Our speciality is currently working on newer and faster ways to move teeth, and as always we continue to be obsessed with the most technologically advanced treatments available! Dr. Nate here today, back at the helm. According to the calendar, and that groundhog in Punxsutawney, spring time is near. And as I am writing this we have just been hit with a late winter snow, so I question why we trust a rodent for our weather predictions…but I digress. The purpose of today’s blog is to highlight the importance of mouthguards. Spring time brings a new series of youth sports, and unfortunately an increase in mouth/dental injuries. Some sports mandate that a mouthguard is worn, but others don’t. Lacrosse, football, boxing and wrestling all make their players wear mouthguards, and that is excellent! Disappointingly, contact sports such as baseball, basketball, softball and soccer do NOT require one. As I talk with my dental colleagues, it is amazing how many of us deal with patients who have been through severe dental trauma as a result of not wearing a mouthguard. Something as simple as placing a piece of moldable plastic between your teeth and someone’s elbow (hello basketball), someone’s head (who thinks multiple people jumping to ‘head’ a soccer ball doesn’t have danger?) or even a bad-hop of a baseball/softball (not every field looks like Progressive Field…) can make the difference between a cut lip and holding your teeth in your hand. I can envision parents nodding their heads at this point…so then where does the resistance come from? The players. Here are the common responses from the kids regarding wearing a mouthguard. I can’t breathe with it. I can’t talk with it. We have decided to take on each of these common complaints in order to improve mouthguard use. We have partnered with the lacrosse teams from North Canton Middle School, Green Elementary and Middle schools, and Jackson Elementary and Middle Schools to provide their teams with custom mouthguards. These fit perfectly and aren’t bulky. We even have a great option for those currently in orthodontic treatment! We are going to use a semi-custom mouthguard that can be remolded as the teeth move. Will a mouthguard prevent all injuries? Of course not, but it will minimize them. Our goal is to do our best to provide area athletes (even those who aren’t our patients!) access to quality mouthguards that kids can wear, without the complaints. Play well this spring, and wear those mouthguards! Dr. Nate here again! I enjoyed last week’s break while Dr. Theresa took the reins with our blog. This week’s post highlights the results of our contribution to Dental Health Month. The best way to explain what we did is to bring in Kate, one of our excellent team members in the Uniontown office. Go to it Kate…! Kate here, and in keeping with the western theme of Bad Tooth Bart, let me say ‘Howdy!’ We had an AMAZING month as our Mellion Team went out to visit schools in our communities to celebrate National Dental Health Month! We had the pleasure of visiting Suffield, Mogadore, Hartville, Uniontown, Lake Center Christian, St. Michael’s, Gorrell, Whittier & Strausser Elementary Schools to perform a play called ‘Bad Tooth Bart’ to help teach students the importance of good dental hygiene. Why do we do this? Let me reference this previous blog post for an explanation. Our play is called “Bad Tooth Bart” and centers on a town whose citizens need help taking care of their teeth. There are good guys, bad guys, cowboy hats, dance moves, cavity bugs and silly string! How could it NOT be FUN??? Although Bart starts out as a bit of a troublemaker, when the townspeople rally to help him in his time of need, he realizes that being kind and helpful is always the best way to go! To see the actors in action, click on this and this to view photos from our adventures, and thanks again to all who participated! Age 7 is perfect for a visit! The American Association of Orthodontist (AAO) recommends that every child see an orthodontist at age seven. Here is a link if you want. The immediate follow-up question is 'does every 7 year old need treatment?' Not at all. At this initial evaluation we note which permanent teeth are present and the relationship of the jaws with one another. We take photos and a panoramic X-ray (PAN) and sit down to explain our findings. In dental school and orthodontic residency we spent an excessive amount of time learning the ‘correct’ tooth loss and eruption sequences. There are charts and graphs, and plenty of test questions on the subject. But what did we find when we began practicing? No child follows the sequence exactly! Instead we have to think through the process for each child. And that is why we spend the time to ensure you, the parent, understand your child’s mouth. Fortunately, most of the time we will recommend routine 6-month checkups where we will continue to monitor growth and development of your child. We recommend early treatment only when there is a sound, research driven reason. That will be covered in a later post. If early treatment is necessary, it will improve your child’s self-esteem, reduce the chance of trauma, and potentially decrease the complexity of treatment in the future. So if your dentist doesn’t mention an orthodontic evaluation around age 7, please have an orthodontist take a look. It could prevent a much more difficult (a.k.a. invasive) road later in life. All of our patients know that we spend a HUGE amount of time discussing how to brush and floss with braces. We do this immediately after putting them on! As most of our team have had braces, they are all experts at explaining the process. They understand the struggle is real. You must be dedicated to the process. What is the biggest concern with bad oral hygiene during orthodontic treatment? Two words: WHITE SPOTS! Remember that braces seal off the part of the tooth that is covered, which protects it from plaque damage. The remainder of the tooth, however, is exposed. Leaving too much plaque and gunk on the teeth will cause the tooth to become soft and turn a chalky white color. That is the start of a cavity, and it is PERMANENT. Google ‘tooth decalcification' to see the devastation. Obviously this isn’t pretty. It is however completely avoidable! And most often this becomes noticeable after the patient is finished with braces. This is the time everyone has waited for…the amazing smile! Instead, all anyone will notice are these white spots that the patient CANNOT brush off! To make them disappear requires hours of work by the dentist, at a tremendous expense to you. So why not read a little further to ensure you are doing everything correctly???? Do I particularly care if our patients exhibit a perfect Modified Bass Technique? No. What I DO care about is that our patients be EFFECTIVE at brushing and flossing. We constantly talk about splitting the tooth into sections, above and below the braces. The area where most patients miss is where the tooth and gum meet. And this is where most of the plaque gathers. Seeing a potential problem here???? The most important area to clean is also the most frequently missed during brushing…! Here is a link to our Youtube page with a series of videos on how to clean with braces. Watch it. And watch it again. Tell your loved ones how much it changed your life. We are in charge of making your smile amazing, and I think we are pretty good at that. But we can’t make you brush and floss. The responsibility is yours. OWN it! You’ll be glad you did. Dr. Nate here! I wanted to explain why I am an Orthodontist. This is a question we get asked at least once a week. Usually it starts with 'how can you look in someone's mouth all day long' or 'you must really love teeth.' Well, there are worse things to spend a day looking at than the mouth, and no I don't have any particular fascination with teeth. For me, the drive to become an orthodontist came from something deeper. It is a passion that continues to this day. For as long as I can remember, Dad volunteered at the Akron Children's Cleft Palate Clinic. It is now called the Craniofacial Clinic as it encompasses all forms of facial anomalies. There are only 7 of these clinics in Ohio, so families come from all over the state to Akron Children’s Hospital. The first thing you realize when you are at the Craniofacial Clinic is how important this place is to kids who need tremendous amounts of treatment, most often beyond orthodontics. There are a team of specialists (plastic surgeons, ENTs, speech pathologists and more) who collaborate on each child’s case to come up with a plan that could start within the first month of life and end in their 20s. Obviously the orthodontics involved is beyond what most people would consider 'standard braces.' Dad would work with the surgeons to help correct some of the most complicated anomalies you could imagine. But it wasn't the physical challenge, or the satisfaction of seeing how great the end-result was that sucked me in. What made me want to be an orthodontist was watching those young adults who had gone through countless surgeries, physical therapy, and, yes, multiple rounds of orthodontics, smile with confidence for the first time in their lives. Obviously, one of the most important aspects of children's dental health is to educate everyone on the dangers of large amounts of sugar consumption. Often that danger is multiplied by the fact that many children don't understand the importance of good oral hygiene. All of us consider this month to be a perfect opportunity to educate children on good oral hygiene habits. To that end, Dr. Theresa and I are following in Dad's footsteps. Throughout our elementary and middle school years, Dad would visit our classes and educate everyone on brushing and flossing. And we loved seeing him! Now it’s our turn, and it is a responsibility we proudly continue. Over the next few weeks we will be visiting 3rd grade classes of 10 schools in our community to present a skit titled "Bad Tooth Bart." It is a funny 'Spaghetti Western' (with student actors too!) that stresses the importance of good oral hygiene. As an aside, if you don't know what a Spaghetti Western is, start here and picture Clint Eastwood. If you don't know who he is, well that is concerning. This is the 5th year we have done this presentation, and I know the kids learn about the importance of oral hygiene. We always take pictures, and in a few weeks we will post some of them in the blog.